Buy the ultimate 'shooters' gift pack. 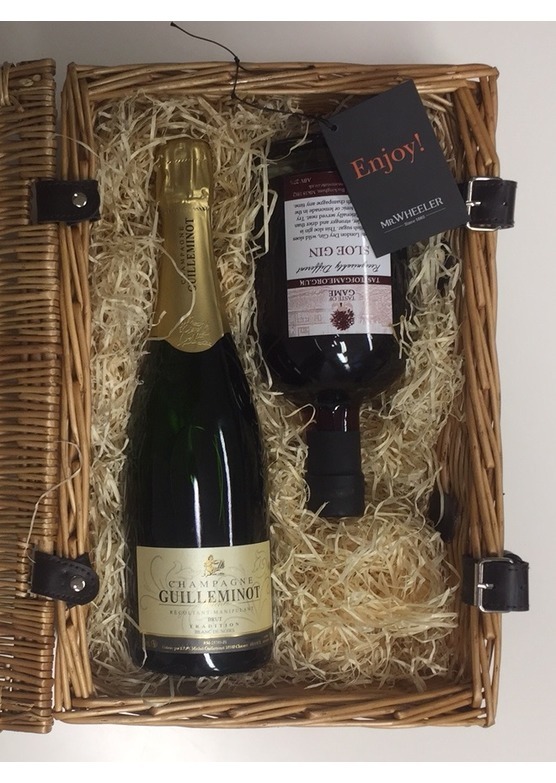 In this gift pack you will receive a bottle each of Taste of Game Sloe Gin and Guilleminot Champagn, all delightfully presented in a wicker hamper. Perfect to create your own "Sloegasm". Taste of Game Sloe Gin (70cl) - Made from wild sloes, sugar and London Dry gin, this sloe gin is paler, stronger and less sweet than most. You will find this traditional favourite a real warmer. Great mixed with champagne (a "Sloegasm"). Michel Guilleminot Champagne (75cl) - Aged 3 years on its lees before being released. Look for fresh, fragrant fruit on the nose; crunchy berry fruit flavours combining with a classic biscuity note and a gentle mousse; and an appetizing, pure, vibrant accent.